This image shows fragment of embroidered cushion decorated with French coquette machine embroidery design. Here you may see this beautiful sample in all smallest details such as stamp in picture. It is executed in dramatic dark shades which are supported by color scheme of whole work piece. Picture is added by printed fabric with beautiful floral ornament and inspired inscription. This close up photo let us examine this amazing work piece in all its smallest details. You may note beautiful printed fabric with floral ornament and cool inspired inscription executed with different fonts. 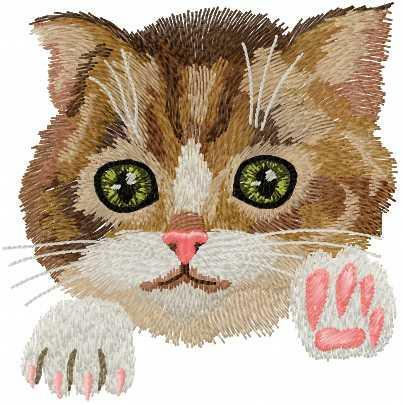 Center of whole composition is definitely French coquette machine embroidery design. This portrait of mysterious woman create true atmosphere of Paris’ streets. 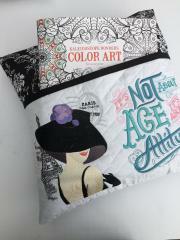 Cushion is added by convenient pocket for magazines or newspapers. This thing is not just convenient pillow for bedroom. It is true work of art which is able to create mysterious and sublime mood for you in your own home. 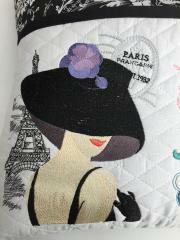 Due to French coquette machine embroidery design you can feel yourself as real French woman who looks at Eiffel tower in wide brim hat. Work piece is added by suitable inscription. This nice interior cushion for children’s room made by JazzyJoDesign is one of best examples of very well elaborated design. It combines all necessary functions and attractive look. On one hand it is soft pillow with convenient pocket on front side. 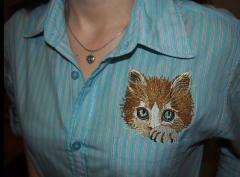 On other hand it is stylish accessory decorated with Zebra free embroidery design. Together all these elements create true highlight of your room. When you will see this nice children’s cushion made by JazzyJoDesign you will definitely want to create such accessory for your own children or little friends. 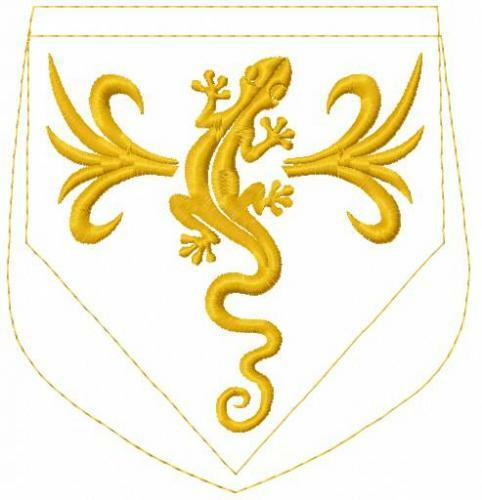 It has very well elaborated design. It is based on convenient pocket for magazines or postcards, bright printed fabric at top and Zebra free embroidery design as center of whole composition. It is added by inspired inscription. This is cool city backpack executed from practical smooth leather. It has spacious body, quality furniture, convenient pocket and pretty cover. 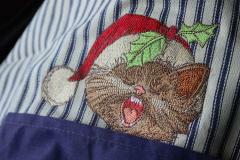 It is decorated with Monday morning embroidery design. This funny picture will make anyone smile when looks at it. Certainly each of us can remember situation when he or she was looking truly just like this crazy owl with big cup of coffee. This is original felted bag of practical color. 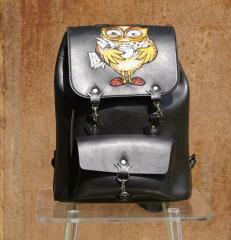 It has impressive geometrical details such as handles and pockets. One of them is decorated with Dream Girl free embroidery design. It is fancy picture if young girl shown from her back. Her fluffy hair is center of composition. Look how creatively author changed original color scheme. Now it is more suitable for this work piece. This is very convenient textile bag for everyday usage. 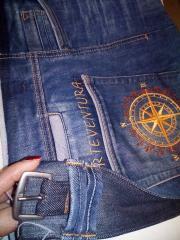 When it is folded it has small size and can be places in standard woman’s bag or even pocket. But when unfolded it is quite spacious. 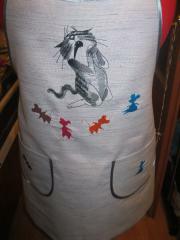 Its front side is embellished with Angry cat free embroidery design. This funny picture shows us grumpy cat which is looking through big hole. It seems to be made by its claws. This is attractive picture which shows forest owl with big wings. It seems this bird is flying right to you. 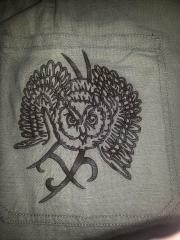 Tribal Owl machine embroidery design is graphic sample executed with thread of just one color. 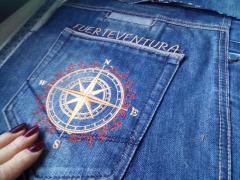 It is used for decoration of jeans’ pocket. This clothing also has quite modest color scheme. So together these elements look monochrome. It makes this picture even more expressive. 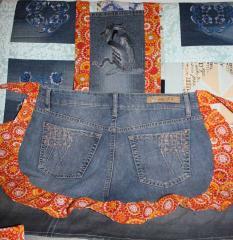 Here you may see process of creating nice stylish bag from used jeans. Highlight of future work piece will be definitely Rose of Winds free embroidery design executed by Ga Bik on pocket of trousers. It is added by name of famous island which is associated with freedom, adventures and taste of life. Together they create composition which deserves everybody’s attention. This is nice idea how to give second life for clothing you love best of all! This picture shows process of work on Rose of Winds free embroidery design. 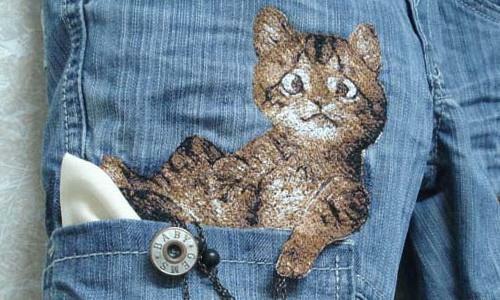 It is difficult to find more cool background for it than pocket of used jeans. Its dense fabric perfectly keeps complex ornament and serves as great complement element of classical color scheme. Due to it this picture made by Ga Bik looks like real sea measure which can shows direction of strong wind in filled sail of ship quickly going ahead!